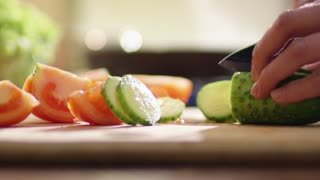 Young girl is cutting a cucumber with a knife. 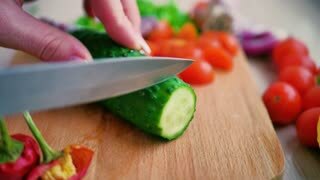 Young woman slicing green cucumbers for a salad with a knife , wooden board. 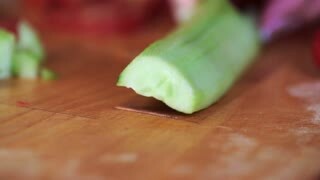 Woman is cutting green cucumbers into sliceswith a knife on a cutting board. A young woman is cooking a salad in the kitchen. 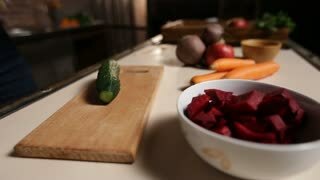 The girl has already cut the red tomato and now she is cutting the green juicy cucumber into many small pieces. Pretty brunette in pajamas is cooking vegetables for breakfast at home. She is cleaning and cutting a cucumber with a knife. Hands with knife cutting paprika. Caucasian girl cooking.